(El Confidencial) The Spanish central government has blocked a proposed rail link from the Port of Barcelona due to lack of money. 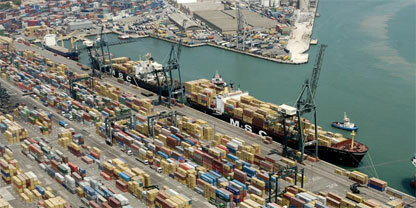 The Chinese multinational Hutchinson is currently working on a project that involves an investment of 420 M€ to build new docks, which requires a rail line (with a cost of just 8 M€) for the delivery of goods arriving at the port of the Catalan capital . However, this output link won’t become a reality. Sources from the Generalitat de Catalunya pointed that the new facilities would have a total area of 100 hectares, among which a mooring line of 1.5 kilometers, housing the largest semi-automated container terminal in southern Europe. But this complex logistic center needs a double-width line (both european and spanish), to re-distribute the goods entering the port. This investment would turn Barcelona into the great gateway of Chinese investment in Europe. They spent 1,200 M€ in the AVE to Galicia, a project that is not a priority, and yet deny 8 M€ to connect the Port. It doesn’t make any sense. Obviously, those eight million would be a temporary solution, since more would be needed to complete the infrastructure. The trouble is that this area is the sole responsibility of the State, if it was ours we would search high and low to get them because of the high importance of the project. Said a source from the Catalan Government, complaining that The Spanish government neither acts nor allows us to act.